Buying at auction is a very simple process. 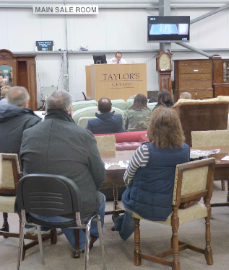 TAYLOR’S AUCTIONS friendly team of experts are always willing to discuss items entered in the auctions with potential purchasers, offering honest and helpful advice in addition to condition reports and additional photographs. All members of our dedicated team are here to help should you need any assistance. Please note that all items purchased are subject to our standard terms and conditions. The process of finding and purchasing a lot at auction is outlined below. 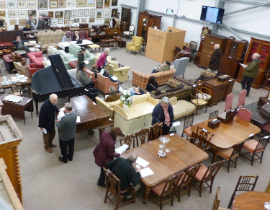 You can visit our salerooms on the Friday prior to the sale from 10am-8pm or by prior appointment where items are on display, you may handle and inspect them and our experts are on hand to answer your questions. We also produce catalogues for each sale. You can view the catalogues online here. The online catalogue has a user-friendly search facility or can be browsed by section. If you are interested in a specialist field of collecting, i.e. a particular artist or ceramic maker, you can create an account and you will be contacted by e-mail when a suitable item becomes available. 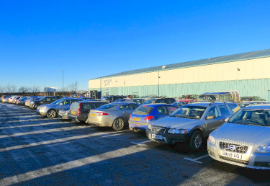 It is strongly recommended that anyone wishing to leave a bid, who has not viewed in person, obtain a condition report from one of our experts, these can be provided by e-mail, phone, fax - these will also appear on the website for those who have registered with an account. On occasions our descriptions do draw attention to condition problems, however, the absence of such advice does not imply that a lot is in good or entirely original condition. Additional photographs can also be provided for lots within the sale by email. Customers wishing to bid at Taylor’s Auction Rooms will need to register for a paddle number at the main office. Customers will be required to fill out a registration card. This is a way of bidding for an item when you cannot personally attend a sale. Commission bids can be left in person, by e-mail, telephone, by fax or via this secure website for users who have registered with an account. We require your full name, postal address and phone number as well as the bid details. Please note you should give us the maximum Hammer Price you are prepared to pay, (remembering to take into account the Buyer's Premium and any taxes payable on top of the Hammer Price). The auctioneer will carry out a commission bid on your behalf and endeavour to purchase a lot or lots at the lowest price possible against any other bids or reserves. In the instance of identical commission bids, the first bid placed will take precedence. This service is offered subject to availability of telephone lines and arrangements should be made before 9am on the day of the sale. Telephone bidding is only available on lots carrying a lower catalogue estimate of at least £50. This service is available on certain sections of the sale and is available via www.the-saleroom.com Please note there is a 4.95% +VAT surcharge over and above the Buyers Premium on all lots purchased via this service. This calculated at 22% of the hammer price, plus VAT on the premium at the current rate, where appropriate. This will be charged on the hammer price of each lot purchased. This currently works out at an additional 26.4% Premium on each lot. Payments can be made at the Cashier's Office, either during or after an auction. Successful bidders will need to pay for the items within 14 days of the sale. Payment can be made by bank transfer, cash, cheque, or debit card. Cheques take 7 days to clear. Please make sure we can accept your card before bidding with us. Please note Card payments where the card-holder is not present will only be accepted for transactions up to £500. All transfers must state the relevant auction number and your bid / paddle number. Droit de Suite is a royalty payable to a qualifying artist or the artist's heirs each time a work is resold during the artist's lifetime and up to a period of 70 years after the artist's death. Royalties are calculated on a sliding percentage scale based on the hammer price excluding the buyer's premium. The royalty does not apply to lots selling below the sterling equivalent of €1,000 and the maximum royalty payable on any single lot is the sterling equivalent of €12,500. Droit de Suite, which is not subject to VAT, will be added to the buyer's purchase price and then passed on to the relevant collecting agency. Please enquire for the accepted exchange rate on the day of the sale. Please note all items of Furniture must be removed within 10 days of the sale. Once items have been paid for in full and if necessary funds have cleared, items can be released to the purchaser.